With employee health paramount to a successful business, our corporate wellness day aims to educate your employees on implementing better nutrition and lifestyle choices making for a healthier and more efficient workforce. We’ll come to your workplace with our BodyMetrix clinical ultrasound system and run our body composition evaluation for each of your selected employees. The evaluation takes around 5 minutes per employee. It is non-invasive and highly accurate. In addition to accurate body fat percentage readings, employees can track their fat loss and muscle gain with us through follow up appointments if they wish. 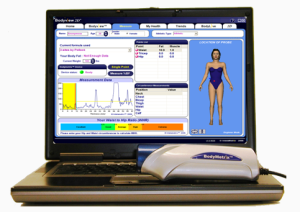 The BodyMetrix System provides an instant comprehensive report, including caloric expenditure and risk levels for diabetes, stroke, and heart disease. 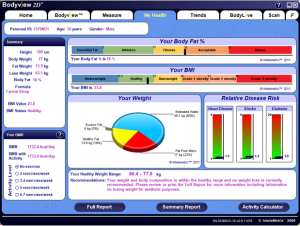 These reports can be printed or emailed directly to your employee empowering them towards a healthier lifestyle. After the body composition evaluations we can run our fun and interactive seminar which focuses on a healthy diet and addresses current nutrition and dieting myths, which finishes with a friendly, informal Q and A. The employer receives a compre hensive report providing tangible, relevant information on the health of its workforce in an effort to combat problems associated with absenteeism, escalated medical costs, workman’s compensation claims, and reduced productivity due to poor health or illness, which are costly and can severely impact a company’s bottom line. In addition to our corporate wellness day we offer discounted individualised programs where we’ll work closer with each employee on a one-to-one basis and look at implementing healthier nutrition for them and their families. We are passionate about the health, fitness, and wellness of local businesses and their employees. Please contact us for more information on our corporate wellness day.